This is just not a good week for Priory Hall developer, Tom McFeely. A warrant, courtesy of Dublin District Civil Court, is out for his arrest for non-payment of a €24,000 debt. His €10m house on Dublin’s upmarket Ailesbury Road is set to be seized in a NAMA repossession. And yesterday, the Agency made a fresh application against him in Dublin’s High Court. The new application (reference number 2012/2880S) was made by National Asset Loan Management Limited whose solicitors are Alfred Thornton and Company, which is, I think, the first time NAMA has used this firm – it doesn’t appear a large undertaking and its website is currently “under construction”. The respondent is solely Thomas McFeely and as is usual in newly-filed applications, there is no solicitor on record for the respondent. This is the second application by NAMA at Dublin’s High Court against Thomas McFeely this year. It is believed the earlier application was to deal with the repossession of the house on Ailesbury Road. In the past, NAMA has taken legal action against individuals to enforce personal guarantees or to secure personal judgments, but it should be stressed that we do not know if either of these objectives lies behind the current application. NAMA generally doesn’t comment on individual legal cases. So far this year, NAMA has launched 20 separate actions in Dublin’s High Court and has been on the receiving end of six. Despite only spending a measly €355,000 on portfolio management fees for the first three months of 2012 – an expense heading which includes receiver costs for which NAMA has budgeted to spend €33m in 2012 – the Agency continues to appoint receivers with gusto. Yesterday’s edition of Iris Oifigiul reveals that the Agency has added seven more companies to its bag. New Quarter Limited is jointly owned by NAMA Top-10 developer, Bernard McNamara and Durkan Residential Limited. Its directors are Barry Durkan and Patrick Durkan. And NAMA had Declan Taite and Patrick Brennan of RSM Farrell Grant Sparks appointed receivers of 19th July, 2012. On 25th July, 2012 NAMA had Simon Coyle of Mazars appointed as receivers to Blackthorn Securities Public Limited Company whose directors are Derek O’Leary and Reginald Stuart Tuthill. The company has eight shareholders – Alan Woods, Christian Carroll, Culpepper Limited, John O’Donovan, Peter Walsh, Reginald Stuart Tuthill and Trentmount Limited (Derek and Belinda O’Leary company). On 24th July, 2012 NAMA had Simon Coyle of Mazars appointed as receivers to Sandyford Forum Developments Limited whose directors/owners are Derek O’Leary and Reginald Stuart Tuthill. Glenville Hotel Investments Limited whose directors are William O’Connor and Randal Doherty and whose company secretary is 75-year old George Valentine Byrne had Declan Taite and/Anne O’Dwyer of RSM FGS Partnership appointed receivers on 23rd July, 2012. The company is jointly owned by Eileen Doherty and Randal Doherty. Fernland Limited is the Dublin based developer owned by brothers Michael and Martin Doran and brothers Ken Fetherston and Michael Fetherston. Bernadette Fetherston is also a director. NAMA had Declan Taite and/Anne O’Dwyer of RSM FGS Partnership appointed receivers on 23rd July, 2012. 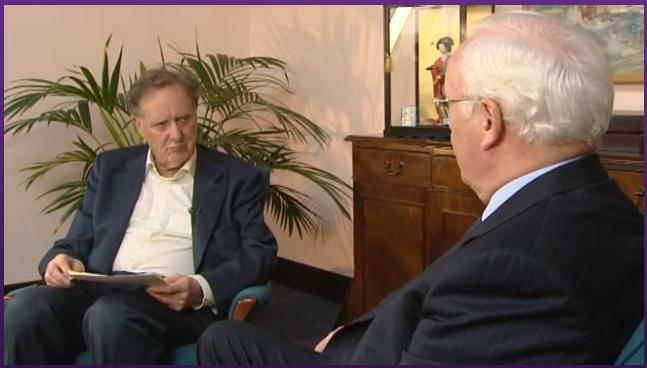 Vincent Browne – image screengrab above via TV3 Tonight with Vincent Browne – not looking at all happy with his little chair whilst interviewing the NAMA chairman Frank Daly after the publication of the 2011 NAMA Annual Report. Or maybe, he’s just not happy with NAMA’s adoption of Hope as a policy. Non-image of the week goes to the former Anglo chairman Sean FitzPatrick who, when transported from the Bridewell garda station to court was allowed drape his blazer over his cuffed hands. Yes, a former banker was in handcuffs this week. Irish residential property has declined 23% between September 2010 and June 2012. Irish commercial property has declined by 20% between September 2010 and June 2012. Yet NAMA now needs just 6-10% of a recovery to break even, whilst in September 2010 it needed 10%. Outstanding! And by the way, in September 2010 they were “taking into account the 5% of subordinated debt” which NAMA doesn’t need pay if it makes a loss, no such reference in July 2012. In actual fact, NAMA will need a blended increase of around 24% to existing property prices – see figures at top of this page – AND it will need cover its operating and interest costs, if it is to break even. But NAMA is now saying that an increase as low as 6% will do the trick! “What I’m saying is that based on our projections, our analysis, we are confident. 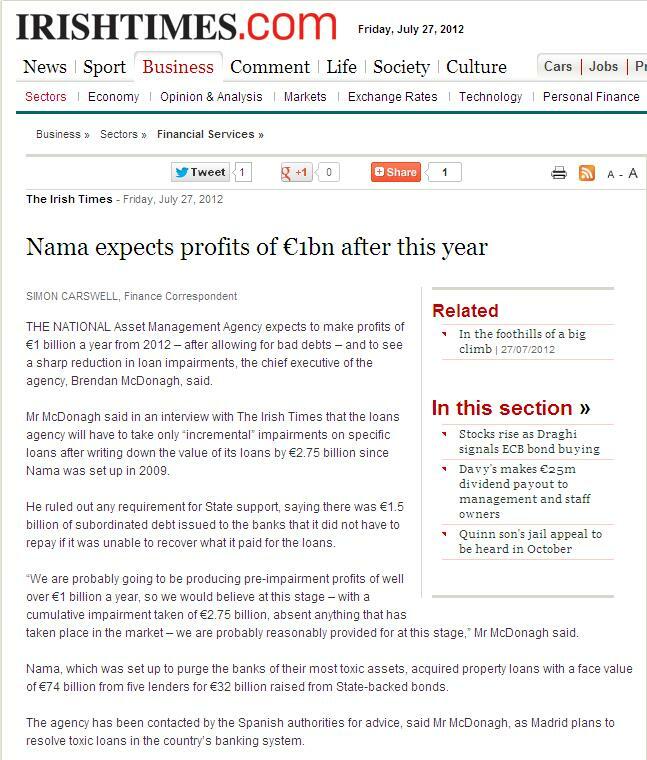 And that’s an objective view of projections, figures, macros and not all our own.” NAMA chairman Frank Daly, July 2012. You can’t blame an Agency for trying to build trust in the property market. After all, the Agency deals primarily in the property market and a loss of trust would be very punishing indeed. Truth be told, the CSO says mortgage-sales prices are down 50% at present. Others say they are down by 60% but if they are right, that indicates that cash transactions are down by 80%-plus if you think cash comprises 30% of the market, which doesn’t seem plausible as presumably valuers wouldn’t sign off on such high mortgage valuations knowing that cash prices were so much lower. Professor Morgan Kelly predicted falls of up to 80%. Commercial property is down by 67% according to both the JLL and SCSI/IPD indices but prime Dublin still costs twice as much as prime Belfast and the National Competitiveness Council said earlier this year that commercial property was still overvalued. The view on here about property prices over the medium term is who knows, but recoveries cannot be accurately predicted with spreadsheets or spreadsheet macros – if they could, we’d all be billionaires! NAMA made a pre-impairment profit of €133m in Q1, 2012 and given Irish residential property has declined 6% so far this year, and Irish commercial is down 4%, it is likely that post-impairment, there won’t have been any profit. So €1bn a year? NAMA has spent just €23,000 on legal fees and €355,000 on receivers in the first three months of 2012, according to its Q1, 2012 management accounts published this week. Given that the Agency has a budget in 2012 of €25m for legal fees and €33m for receivers, the figures look distinctly odd. Mind you, NAMA continues to keep the accounting profession in German cars and has spent a more typical €562,000 on audit and accountancy services during the quarter. Still though, a measly €23,000 on legal fees? Does this mean there are desperate hordes of besuited and bewigged ones now relegated to stalking the streets of Dublin chasing ambulances? Runner-Up goes to NAMA and its legal action with the Information Commissioner, Emily O’Reilly in her role as Commissioner for Environmental Information. This is the legal case that NAMA doesn’t want to talk about. The heroic Gavin Sheridan at thestory.ie has been trying for more than two years to have NAMA declared to be subject to environmental information requests on account of its status as a public body. NAMA has fought Gavin tooth and nail every step of the way, and even though Ireland’s guardian of transparency, the Information Commissioner has sided with Gavin, NAMA has continued its resistance in the courts, where this week it spent a couple of days trying to convince the courts that NAMA is not in fact a public body and was accordingly not subject to environmental requests. According to Gavin, he expects a decision “in the Autumn”, which means from September onwards and he is “50/50” about the outcome. NAMA uses the misdirection of being forced to hand over commercially sensitive information, should it lose the case, but the rules already provide for bodies to exempt themselves from providing such information. If Gavin, or more correctly the Information Commissioner wins then we might be able to force NAMA to provide us with a list of all its property – not just the foreclosed stuff – and we might also see what remedial work it has done on ghost estates, or – as in the case of the Gleann Riada block in Longford that it is presently demolishing – it has done nothing and spent nothing in securing, protecting and maintaining these estates. The paradox is that NAMA keeps on telling us it is transparent and supports transparency as long as it doesn’t offend the NAMA Act. However the NAMA Act is not being used very much in these proceedings and NAMA is now scaremongering that a victory for Gavin here, would mean other bodies become subject to environmental requests. The spectacle of the State spending considerable sums in suing itself hasn’t gone unnoticed on here either.